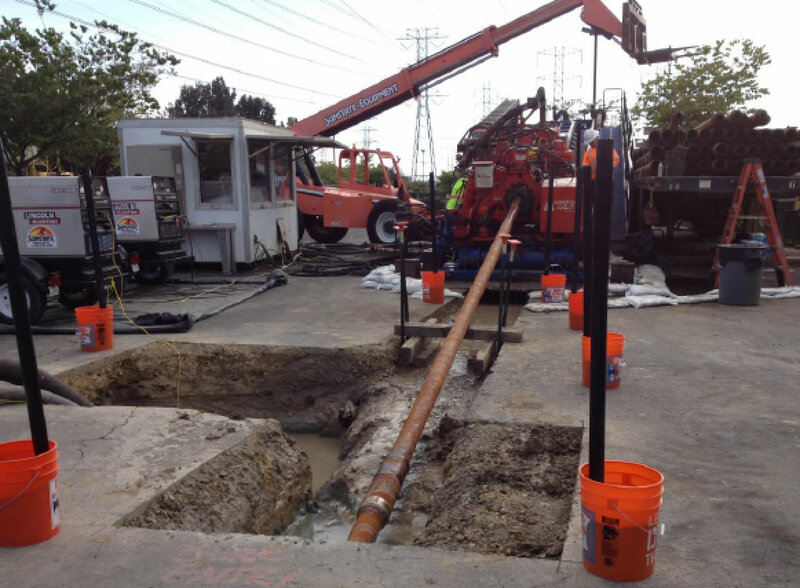 Bennett Trenchless Engineers served as the trenchless consultant to PG&E to upgrade the capacity and relocate a portion of a 36-inch steel gas transmission line under Interstate 880 and an unlined flood control channel. The Interstate 880 crossing was a key element of the Line 107 replacement project and was located in a tight utility corridor in a congested urban area. Bennett Trenchless conducted a trenchless feasibility analysis to determine the most appropriate method for the crossing. HDD, guided boring, open-shield pipejacking and microtunneling were evaluated. After HDD was selected as the recommended method for installation of the 1,200-foot crossing, BTE evaluated potential bore alignments, evaluated settlement and hydrofracture risks, and conducted pipe stress calculations. Bennett Trenchless also provided full-time on-site inspection services and assisted in analysis and approval of the pilot bore alignment prior to reaming and pullback. Challenges included restricted pipe laydown area requiring the pipe string be laid out in three sections, environmental concerns related to crossing the flood control channel, settlement and hydrofracture concerns crossing beneath Interstate 880, minimizing impacts on nearby residences and businesses, and working below high voltage power lines. The profile was selected to manage settlement and hydrofracture risks to the interstate and canal while maintaining installation pipe stresses within acceptable limits.